The XDJ-R1, the industry’s first1 DJ System to feature wireless control functionality through an iPad, iPhone, or iPod touch via Pioneer's specially designed remotebox app. The versatile system features Wireless Direct, to enable wireless connectivity with an iOS device even when a WiFi network is not available. 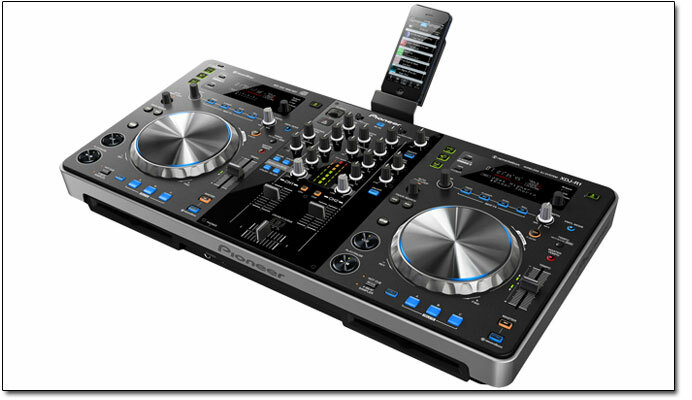 The XDJ-R1 also features Auto Beat Loop, Beat Sync, USB device connectivity, built-in CD players and MIDI control. By utilizing the remotebox app with an iOS device such as an iPhone, iPad, or iPod touch, the XDJ-R1 can be remotely controlled wirelessly, giving DJs the ability to continue their music mixing performance even when they move away from the system. Many of the system's functions can be accessed directly on the display including controlling volume levels, choosing and changing songs as well as the ability to mix songs from a USB device plugged into the system. Users can also apply the "Auto Beat Loop" function3 that automatically loops music at a specific tempo as well as intuitively control various effects using the X-Y pads from a smart device. 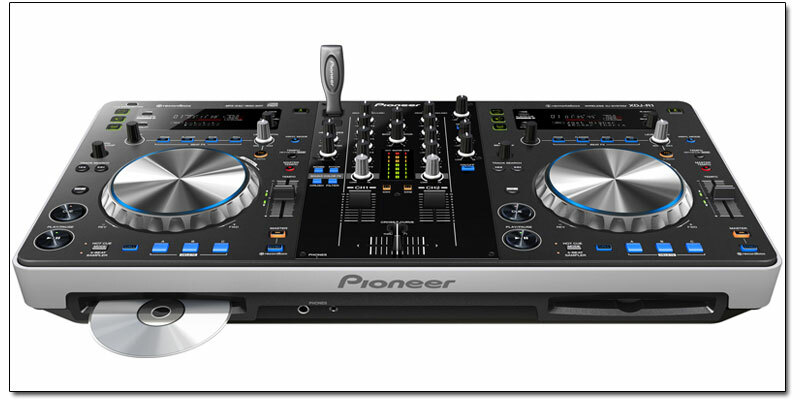 Unlike conventional systems, the XDJ-R1 is equipped with dual CD players in addition to a USB port for media playback. The system supports a variety of different music formats including conventional compact disc, a CD with MP3, AIFF and WAV files, and a USB storage device with MP3, AAC, WAV and AIFF files. For added convenience, the unit also offers MIDI support for operation of various DJ software. Beat Sync4 - With a touch of the Sync button, the system automatically synchronizes the beats of songs analyzed through Pioneer's rekordbox music management software. Hot Cue - The unit features three points of Hot Cues to enable playback of music from specific points. Sampler - For added effects including Trans, Flanger, Echo, and Roll are available to combine with songs currently playing. Sound Color FX - The unit offers four additional effects (Filter, Crush, Noise and Jet) for more creative mixing options. Quantize Function - Automatically corrects synchronization of effects when using Auto Beat Loop or Beat Effect. Noise Reduction - To significantly reduce noise, internal analog and digital circuits were separated, and the distance for digital conversion of analog input signals were shortened. All signal processing is conducted using a high-performance CPU for clear audio output. Internal sound card (Audio Interface). Complete with Master Out (XLR), Booth Out, AUX and MIC ports. The remotebox app with an iOS device such as an iPhone, iPad, or iPod touch, allows the XDJ-R1 to be remotely controlled wirelessly, giving DJs the ability to continue their music mixing performance even when they move away from the system. Many of the system's functions can be accessed directly on the display including controlling volume levels, choosing and changing songs as well as the ability to mix songs from a USB device plugged into the system. 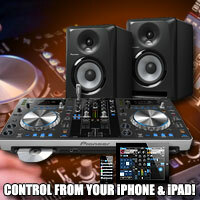 Pioneer's remotebox app is available now at no charge from the App Store. rekordbox software is included with the XDJ-R1. The rekordbox software enables users to prepare and manage music stored on their computer. It can be used to classify and search for music files stored on a computer and crete playlists. It detects, measures and adjusts beats, tempos (BPM) and other elements of the music files prior to a performance. It can also be used to set and store point information (for cueing, looping, hot cueing, etc) prior to a performance. 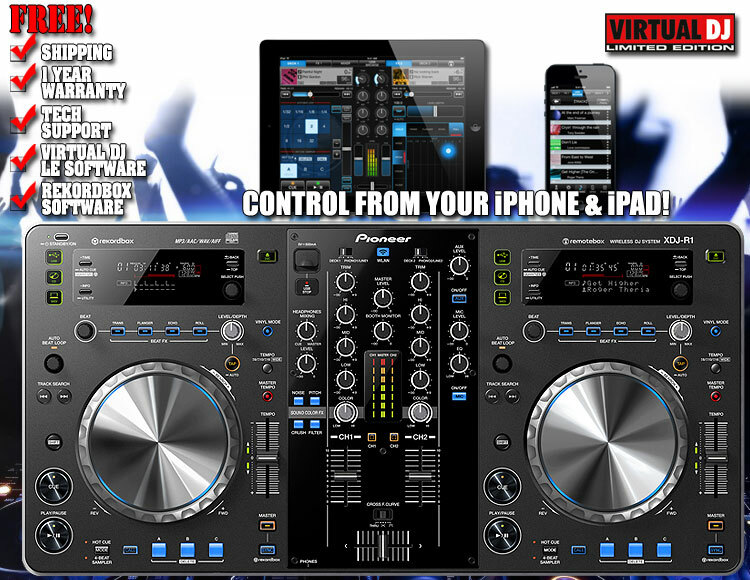 The Virtual DJ Limited Edition DJ software5 by Atomix Inc. is free to download with the purchase of an XDJ-R1. The software features an easy-to-use user interface for the XDJ-R1 and enables optimum enjoyment of various DJ play styles with features including loops, effects, a sampler and 4-channel mixing.